Using a simple word-per-page story-telling technique, these unique board books are perfect for preschoolers, enticing for early readers - and fun for grown-ups who love to fill in the gaps! 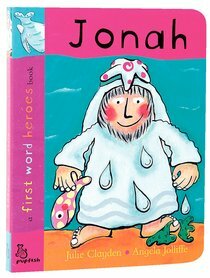 About "Jonah (First Word Heroes Series)"
Julie Clayden is married to Jonathan and has two sons, Matthew and Nathanael and lives in Cheshire England. Angela Joliffe is a successful children's book illustrator who has collaborated with popular children's authors Bethan James, Jenny Fry, and Julie Clayden.